A game about Vikings dying gloriously in battle? Sounds like an odd yet interesting premise. And with elements of card drafting, area control, and even a little set collection, Midgard delivers on that interesting premise thematically and strategically, all in a game that lasts under an hour. What did we think about it? Take a look! 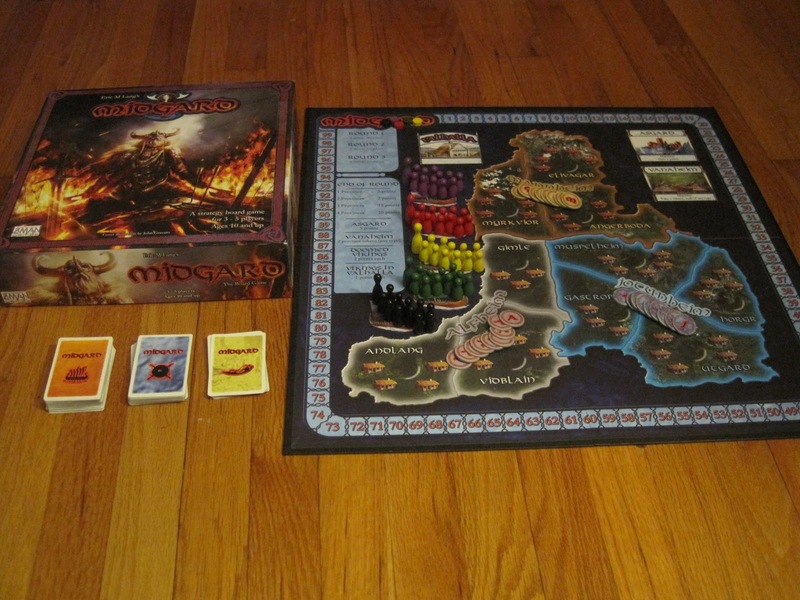 Midgard is a Viking-themed area control game played over three rounds. The goal is to score the most points by controlling provinces and sending Vikings to their doom in the Ragnarok. Each round follows four phases: Doom, Draft, Actions, Score. The map with hard-to-pronounce names (though not so hard if you’ve seen the movie THOR). At the start of each round, five random provinces are “doomed,” meaning that Ragnarok is taking place there, and at the end of the round, everything in that province is guaranteed to die gloriously. Now, it may not seem like a good idea to have your Vikings killed off every round, but every Viking who dies in a doomed province scores three bonus points. Thus, the doomed provinces are usually the most hotly contested places on the map. Once all players have drafted their full hand of cards, they reveal any gold cards they have, and the player with the highest-valued gold card goes first. Players take turns playing action cards and moving their Vikings until the round’s actions have been exhausted. 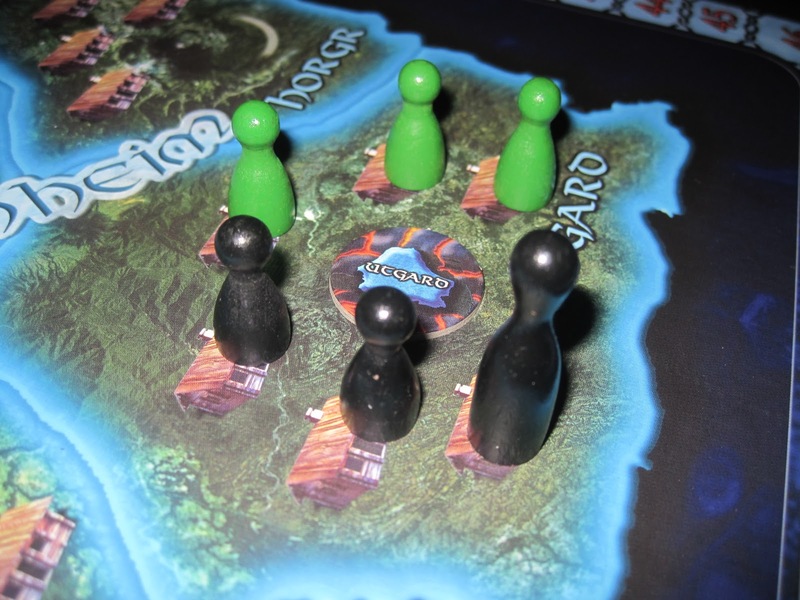 Next, players receive kingdom tokens for the corresponding region of each province they occupy. 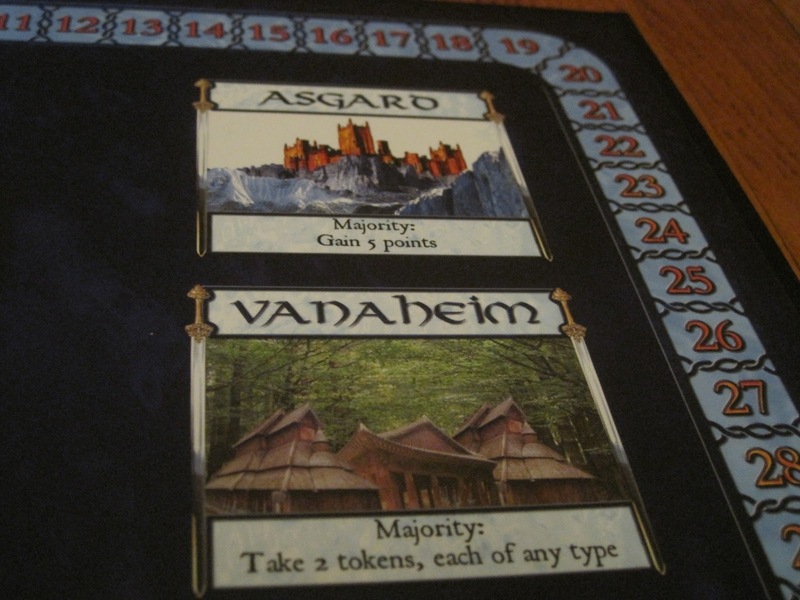 At the end of the game, kingdom tokens are worth five points for each set of three Mannheim, Alfheim, and Jotunheim tokens players have. Then regions are scored based on majorities. Players score more points the more provinces within a region they control. 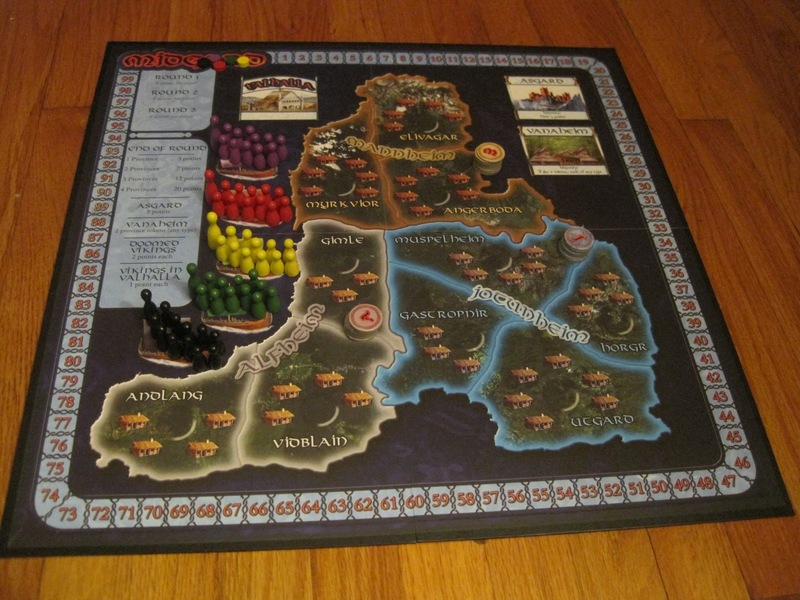 There are also two special regions on the board, Asgard and Vanaheim, which offer players advantages if they control them. 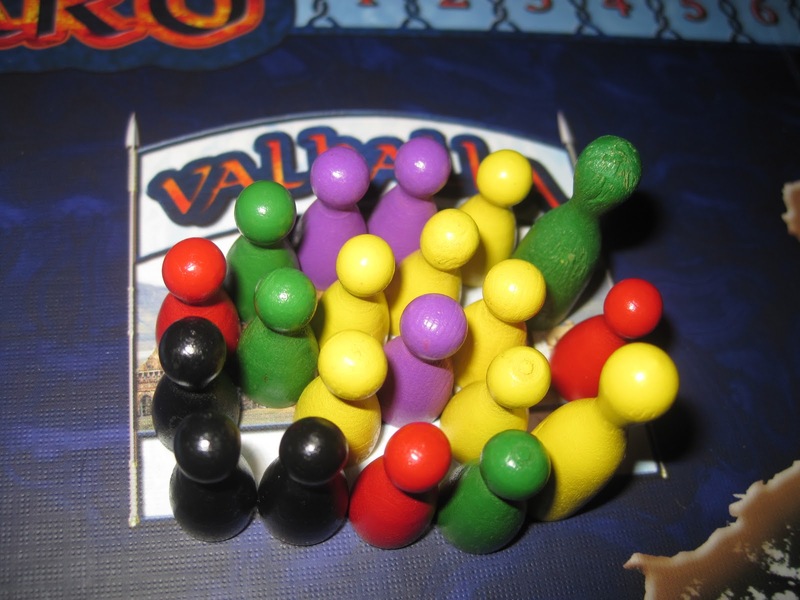 Once all of the regions have been scored, all the doomed Vikings are sent to Valhalla and score points, and all the Vikings in Valhalla (including the doomed Vikings) are moved back to the players’ Viking ships, ready to be placed back on the board in the next round. At the end of three rounds, the player with the most points wins. Midgard can be a vicious, cutthroat game. It’s also immensely fun. I borrowed this one from my brother-in-law (and in exchange left El Grande behind). It’s fitting that these too games were exchanged, as it’s hard for me to talk about any area-control game without mentioning El Grande. Midgard certainly bears comparison to its predecessor, and while I would rather play El Grande if all things were equal, Midgard has an overwhelming advantage over its meatier older brother when it comes to getting games to the table: it plays in less than an hour. Really, the main comparison with El Grande is the area-control aspect. The actions play out differently, and the card-drafting mechanic makes the game feel fresh. Midgard also has a great simplicity that makes it easy to teach. Because everything is dictated by the cards that are drafted and the types of cards that are drafted are mostly the same, there is very little to learn. A big body count. Vikings in Valhalla. One of the things that I greatly enjoy about Midgard is the balance in the cards. I like the drafting round because it helps me plan my strategy for the next round, but there are no guarantees that the round will play out as I’ve planned it. This forces players to draft a good balance between invade, attack, and special cards because while invades allow you to occupy empty villages, if all the village spaces are taken in a province, there’s no way to get in without an attack. Similarly, if all the spaces in a province are empty, you can’t get in with an attack card. Drafting gold cards increases the chance that you will have to go first in a round, but passing them along means that another player will get to have them (and the gold cards are generally worth having). There are also “New Warrior” cards, which allow players to permanently add another pawn of their color to the board, but while these are useful in moderation, they are not very effective at moving pieces around on the board. I also like that the game has several viable strategies toward victory. Snagging the majority in a bunch of provinces can net you lots of points, but so can collecting kingdom tokens and occupying doomed provinces. There are lots of variables to consider and watch, and that keeps the game fresh with each play. The game box says the game is for three to five players. Three player games allow for more strategy, but they also (in my opinion) are not as fun. The game is good with four, but fantastic with five. The game’s chaos level goes up with each player added, but so does the fun factor. Is Midgard the best game out there? Probably not. But is it a catalyst for fun every time it hits the table? Yes it is. Midgard is a thematic area-control game that can be played in less than an hour and offers great interaction. 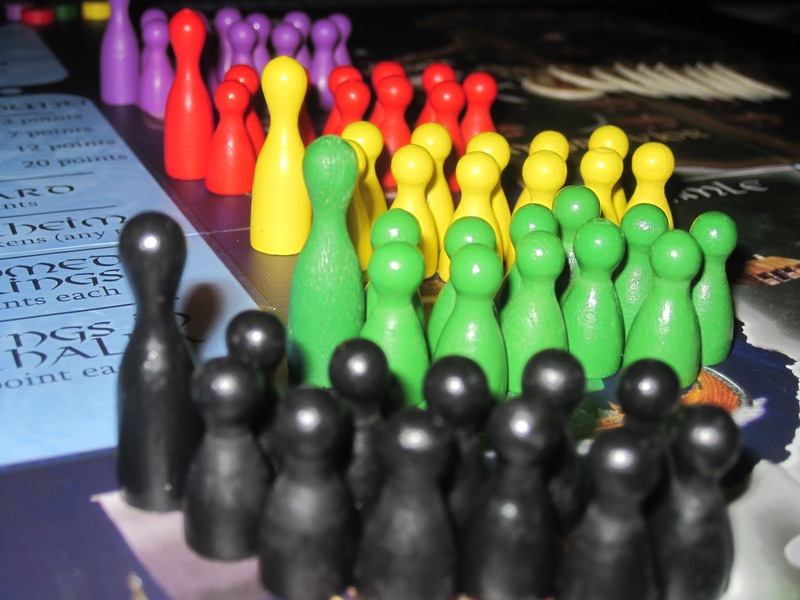 It’s no El Grande, but its streamlined play and easy rules make it a frequent guest at gaming functions. And it’s one you can play over a lunch hour, which is always a plus. With a Euro-style feel that actually incorporates the theme into the gameplay somewhat (Vikings! Dying gloriously! ), I found Midgard to be very enjoyable. What stands out the most to me, I think, is the ability to cultivate a variety of strategies. In a lot of area-control games, the key is simply controlling the best locations on the map for the longest and trying to push everyone else away. With the variety of ways to score points, Midgard offers the ability to approach your choices with creativity. Players always have access to the heavens. For example, you could ride on the “dying gloriously” element, aiming to get your Vikings in the doomed provinces and score your points that way. Or you could carefully weave your pieces into a particular region, attempting to score big with multiple provinces. Or you could try to lie low the whole game, but spread out into as many provinces as you can, so you can collect the kingdom tokens for a last-second victory as final points are tallied. All of these strategies are viable, and you can mix-and-match. The question is, how well will you execute your plans? The card-drafting element really sets your plans before you have a chance to put them into action, so you have to choose carefully. The cards you receive dictate your strategy—which often means you have to adjust your strategy on the fly. You may not get all of the cards you want, so you have to be on your toes. Of course, this can get frustrating, especially when playing with new players. Certain cards look incredibly valuable and tend to get hogged, preventing you from getting them, but when it comes into the action phase, having too many of one card is going to hurt them. But it also hurts you to not have any of that card, which means where you sit could affect the outcome of your game. The weakest element of the game is how player order is determined for the action round. It’s always clockwise, but the first player is the player with the highest gold card. Gold cards are usually pretty powerful, and going first is a big disadvantage, so that makes sense. However, if someone has a 14 gold card and the player to the right has a 13 gold card, the player with the 13 gets a pretty big advantage, having that very powerful gold card and going last. Still, it’s only one card, and it’s generally not a great strategy to stock up on a bunch of gold cards. And player order is likely to change in the next round, giving a new player an advantage. However, there are key moments when player order makes a big difference in the outcome of the game, which can be tough. Vikings on boats, ready to invade. It is possible to gang up on someone in this game. But that’s generally a bad strategy—you’ll make that person lose, but instead of pushing yourself to the top, you’ll most likely let another person take the cake. You have to play a little bit of offense, but also play defense by cutting down the other players’ scores. Fortunately, dead Vikings (even non-doomed Vikings) score points, so there shouldn’t be too many hard feelings around the table. You have limited resources, and you never have enough time or tokens to do everything you want. This means that every choice you make matters; every decision is important. Unfortunately, this can lead to a little analysis paralysis, which can make the game last waaay longer than it needs to, so bring a snack if you play with people who suffer from that. All in all, Midgard is a nicely strategic, relatively quick-to-play, delightful little game with a unique theme and solid execution. Previous ArticleWho Teaches the Teacher? Next Article FDQ: Quality or Quantity? I have this one on the wish list and it goes up and down – this review is sending it back up a little! 🙂 A choatic game with Vikings in under an hour? Sign me up! Plus the fact that you’ll score points even when you’re attacked should help mitigate the spite factor. I’m wondering if the card drafting mechanic and its central influence on game play creates too much randomness for most gamers and that’s why this one has been low on most radars and rankings? Jason, from what you’ve shared here and on your own blog, Midgard sounds like a great choice for your family. I’m not sure why it isn’t rated higher than it is. BGG tends to skew toward longer games (at least in the highest spots), and the components for this one are fairly basic (Pandemic-like pawns, pretty much). It also has more theme than a lot of Euros. We can’t have that! I am glad Chicago is enjoying my game as much as Lincoln, Nebraska has!